INM’s Wear It tab allows you to change nail length, shape, skin color, and polish color to see how products will look on you or your client. They even have a male hand and feet. 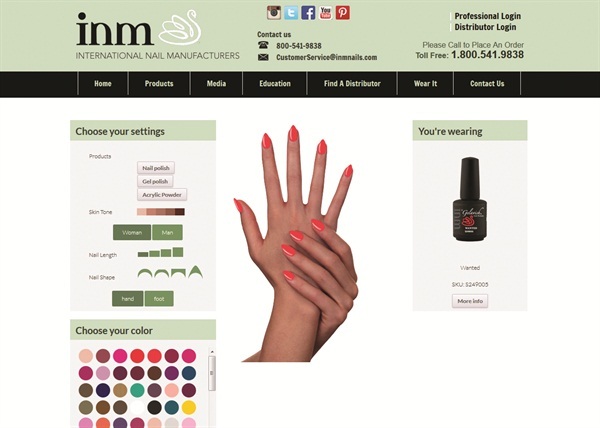 What: INM’s Wear It tab allows you to change nail length, shape, skin color, and polish color to see how products will look on you or your client. They even have a male hand and feet. Why click here: This is a fast and painless way to sell clients on gel-polish or acrylic colors. The combinations are endless and all-encompassing. The vibe: Customizable, current, easy to use.